Five Palm Springs High School students participate in after school project that will continue to gain wall space in the fall. 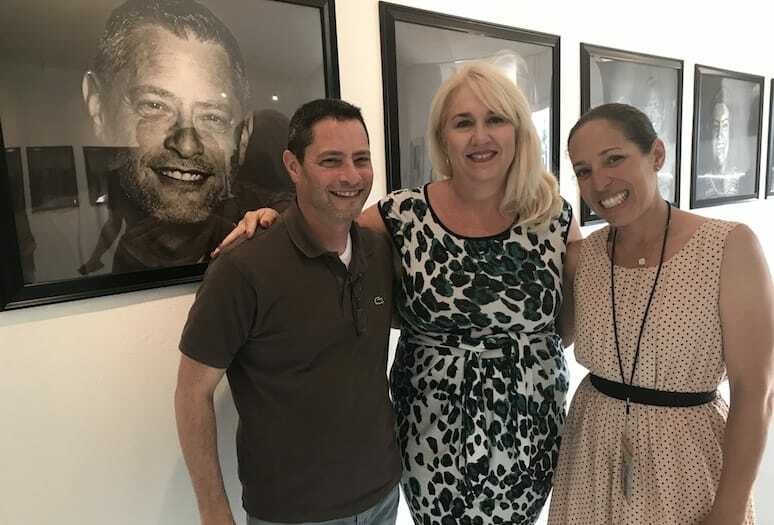 (From left) Steven Biller stands by his black-and-white portrait with Louisa Castrodale, arts coordinator for Palm Springs Unified School District, and Jen Henning, arts coordinator for the City of Palm Springs. When photographer Chari Godakanda agreed to be the artist-in-residence for a joint venture between Palm Springs Unified School District (PSUSD) and the city to showcase the city’s diverse community in photos, he drew from his own background. Through his professional photography experience, Godakanda learned that every face can tell a story. Now it was his charge to engage five Palm Springs High School students to capture the city’s diverse community in a single photo exhibit. 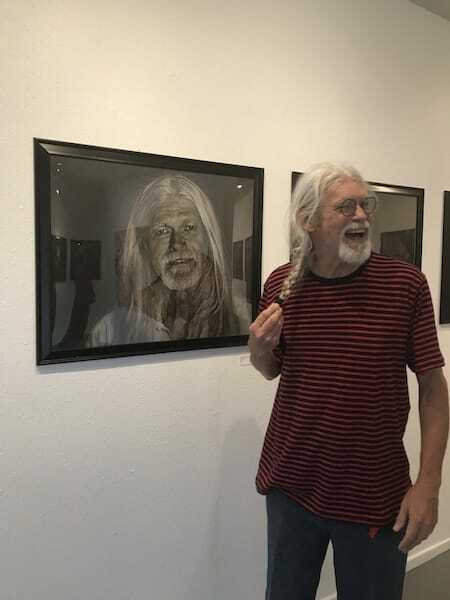 “Portraits of a City,” the recent student photography exhibit held June 8–10 at the Julianna Poldi Gallery at the Backstreet Art District in Palm Springs, showcased 20 black-and-white portraits of local residents. “The time seemed right for the theme of this project now that our country is so politically divided, says Louisa Castrodale, arts coordinator at PSUSD. Godakanda and Castrodale teamed with Jennifer Henning, public arts coordinator for the City of Palm Springs, on the photo project. Through teachers, they attracted five students, all juniors interested in photography, to work before and after school on the project. The quintet included Sandra Sarabia, Liza Anaya, Pamela Gemora, Vanessa Rodriguez, and Yarely Palacios. Photography is not part of PSUSD’s regular curriculum, so it was a big attraction, Castrodale says. Instead of handing out digital cameras for the students to use, they used Godakada’s Canon DSLR, and the same background for all of the pictures. “We chose a plain gray background because it looks great, whether you are black, white or brown,” Godakanda adds. To look for subjects, a booth was set up one night at Villagefest, the weekly street fair on Palm Canyon Drive in Palm Springs, and two weeks later outside Godaka’s studio at Backstreet Art District in Palm Springs. “We wanted to mix it up. We needed faces, and not models,” says Castrodale. One subject admires his portrait at Julianna Poldi’s gallery at the Backstreet Art District. Castrodale, Henning, and Godakanda served as the judges, and whittled down the 50 photos to the final framed 20. Eva Gradilla, whose own photo and that of her young son made the cut. Gradilla is open mouthed and laughing without makeup. “I had just worked out, but I wanted to support Chari and this project,” Gradilla says. She commended Gamora, with making her feel at ease. “She asked me to give her mad and aggressive expressions, and then she surprised me,” Gradilla says. 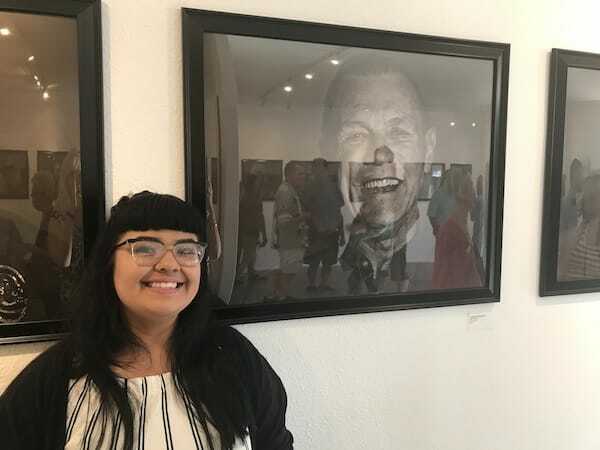 Liza Anaya was one of five Palm Springs High School students to participate in the portrait project. With the popularity of this exhibit, it’s going to be traveling, adds Castrodale. “We would like to show it at Palm Springs High School in the fall when school resumes, and it may even be shown at a city office later in the year,” Castrodale says.